The usual preparations had kept me busy for weeks before the trip, with days getting progressively longer and nights shorter as the departure was approaching. The last night prior to the departure was occupied with packing and preparing everything for my extended absence. At the end, although I had managed to finish in time for my departure, I did not get any chance to sleep. Much worse, I had violated my own unbreakable rule of going through the checklist at least twice to confirm that I had not left anything behind. Sure enough, a cursory just-in-case glance over my packing area, when I was about to step out, had revealed a pile of charts and maps that I had forgotten to pack! Finally departed, with my usual load of five duffel bags containing everything from my inflatable kayak to six weeks of food, plus two small carry-ons with camera gear and electronics. Arrived to the bus depot with some time to spare. While paying for the extra luggage, I asked the ticket agent if it would be possible to drop me off at the Port Hardy ferry terminal, some distance away from downtown. This was not a problem, and all my luggage got the corresponding tags. The trip to Port Hardy was uneventful. I had used the travel time to get some sleep, possibly a few hours in total. A short stop at Wasp, with the bus driver warning everyone not to venture far off: bears seen in the neighborhood. Back on a bus, now passing through the areas where I had paddled before: a turn to Telegraph Cove, a bridge over Nupkish River, and a stop at Port McNeil. The bus was running late and I was glad that I had decided not to try my luck with arriving to Port Hardy downtown first and trying to make it into the outdoor store before the closing time. I would have had no chance at all. Once I was dropped off at the ferry terminal, an employee had immediately helped me loading my luggage on a cart labeled “Klemtu” and directed me to the ticket office where I had pad the $10 stowage fee covering extra pieces. Once all official procedures were over, I had settled down outside to study the map. A gentleman from Bella Bella stopped by to look at my map and we had a nice chat. Meanwhile, it was getting windy making an outdoor stay uncomfortable, and I had decided to move back into to the terminal. It was filling up fast. Most passengers seemed to know each other. Everyone was saying Hello to an old gentleman in a wheelchair, likely a well-known elder from one of the First Nations communities on the ferry route. Finally, the boarding was announced. Once on the ferry, most people seemed to settle down on the floor, between seat rows, spreading air mattresses and blankets. I had regretted that I had checked in my sleeping bag and inflatable pad: it would have been much more comfortable to spend a night on the floor than in the seat. There was nothing wrong with the seats: they looked comfortable enough, similar to those in business class on flights. Still, the sleep was not going to be as relaxing as on a floor, on a soft pad and inside a comfortable sleeping bag. A family next to me was from Klemtu, a couple with a teenage daughter. The husband had almost immediately started showing me some signs, as if depicting various animals. After I tried to guess several times what these signs meant, he had declared that I was OK. Still don't know if I got it right or if he was trying to be nice to me. Later I learned that he was a First Nations artist. The ferry was Queen of Chillowack, a smaller vessel made in Sweden and running this route in summer months. Its main advantage was that, due to the size, it could dock in downtown Klemtu. 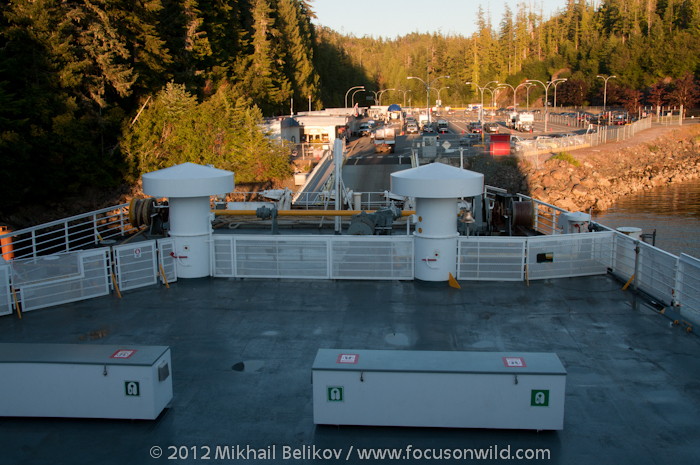 The main and much larger ferry Northern Expeditions had to dock at a new remote ferry terminal, two kilometers away from Klemtu. It was already well past 9:00pm and I was getting hungry. I headed for the cafeteria. The only food available was some snacks. I had asked if any sandwiches were left: none, but the staff was happy to make one for me. I was about to accept this kind offer when I saw a sign announcing that dinner would be served at 10:00pm. Got a tea and decided to wait for a hot meal. While waiting, checked out the ferry, already underway. 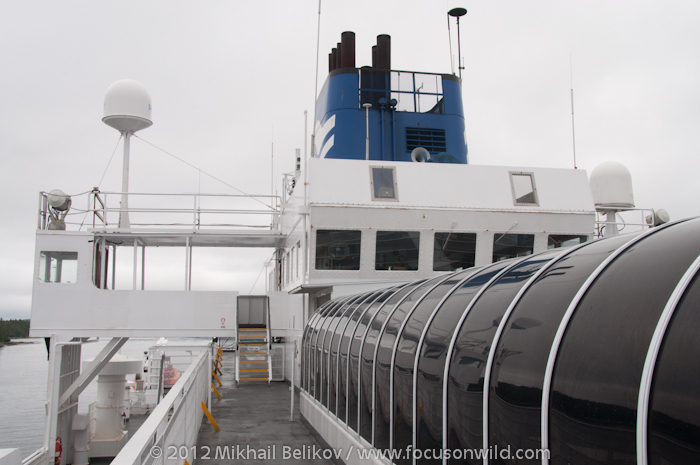 On the upper deck I had discovered a neat place called “Solarium” with a rounded roof filled with windows, looking like a greenhouse. It might have well been used as a solarium on sunny summer days. This time, however, it was nearly full with tents and people sleeping on the floor on their camping mats. A mental note: next time, have my sleeping gear with me and head strait for the solarium. One couple had even pitched a tent outside, on ferry's bow. The dinner was ready. I got well-made chicken fingers and fries, and appreciated a good meal in calming surroundings. Returned to my seat close to 11:00pm and settled down for a night. Copyright © 2012 Mikhail Belikov. All rights reserved.